James P. Blaylock’s short story, ‘The Ape-Box Affair’ was published in 1978. One of the very first pieces of Steampunk fiction, it was soon followed by KW Jeter’s Morlock Night and Tim Powers’ The Anubis Gates, all three of which set much of the architecture of the steampunk movement in place. 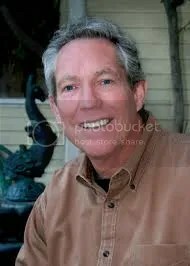 Blaylock has spent the last three decades winning multiple awards and establishing a career as one of the premier Californian writers, as well as a leading voice in magical realism. He’s also returned to the world of ‘The Ape-Box Affair’ several times, most recently in his new novel, The Aylesford Skull, out now. I talked to him about Langdon St Ives, the evil Doctor Narbondo, the birth of steampunk and what’s next for both St Ives and Blaylock. Tell us a little about the Doctor Narbondo books and how Langdon St Ives relates to them? I’ve always thought of the books as Langdon St. Ives stories, with Dr. Narbondo being St. Ives’s nemesis and the stories’ evil genius. Narbondo figures into most of the stories, although by no means all of them. In fact, some of the stories give more stage time, so to speak, to St. Ives’s companions than they give to St. Ives, depending on the plot of the stories and to my writerly whims at the time. The first St. Ives story was titled “The Ape-box Affair,” and it was published in Unearth magazine in 1978. I was reading a lot of Stevenson and Wodehouse at the time, and was inspired to write something with a sort of mixup of their literary sensibilities and my own. That became the first Steampunk story published in the U.S., and for that I’ve been referred to as the Grandfather of Steampunk. In fact, K. W. Jeter and Tim Powers were also writing novels of Victorian era science fiction or fantasy, but because they were novels they took longer to write and get into print. K.W.’s Morlock Night was published soon after my book, and Tim’s The Anubis Gates followed. The term “Steampunk” was coined by K.W. in a letter to Locus magazine in 1988, and the term immediately fell into common use, but up until that time we had no idea that we had launched a sub-genre of any sort. We were all just writing what came into our minds. Anyway, I had so much fun with “The Ape-box Affair” that I intended to follow it with a string of stories, but I got drawn into writing novels instead, and the next St. Ives story didn’t appear until 1984, a story titled “The Idol’s Eye,” which featured Narbondo as a character, although when we meet him he’s magically petrified in a Borneo jungle. Another character gouges out one of his ruby eyes, and, enraged, the idol makes its slow, lumbering way back into London in order to wreak havoc on the people (St. Ives and his pals) whom he considers responsible for the theft of his eye. What was the inspiration behind St Ives? St. Ives was inspired by Sherlock Holmes and by Prince Florizel of Bohemia, also known as Theophilus Godall. The Return of Sherlock Holmes was pretty much the first adult novel I read, and it had a lasting impression on me. I’ve always been a Holmes fan, and given that I needed a scientist/explorer type who also solved mysteries and fought an evil genius, it was impossible not to be heavily influenced by Holmes. At the time I wrote “The Ape-box Affair,” however, I was attempting to read all of Stevenson, and was caught up in the stories in The New Arabian Nights, which featured an amateur detective: Prince Florizel, deposed Prince of Bohemia, living in London under the alias Theophilus Godall. His Watson, so to speak, is a character named Colonel Geraldine, who also uses an alias. I’ve never seen this confirmed, but I suspect that Conan Doyle had been influenced by Stevenson, and that there’s something of Prince Florizel in Holmes. Most writers are standing on someone’s giant shoulders, after all. One of the things I love about the book is how grounded it feels in British geography whilst still having fantastical elements. What research did you have to do to achieve this? The book took a heap of research, actually. One of my favorite parts of that research had to do with the North Kent/Thames Marshes. I shifted back and forth between the Erith, Cliffe, and Eastchurch Marshes, finally settling on the Cliffe Marshes for reasons of size, proximity to Aylesford and London, the way it encloses Egypt Bay, and the rich history of the place. I had established in a previous St. Ives book (The Affair of the Chalk Cliffs) that Uncle Gilbert was a bird fancier; that and my wanting to make Alice St. Ives a fisherman (fisherperson? Fisherwoman?) led me to books and articles on English natural history. All of that worked nicely to ground the book, as you say, and turned out to be a real pleasure. I’m most often inclined to give the same play to setting in a novel that I give to major characters. About a year after the doings of The Aylesford Skull he goes on a sea voyage with Hasbro, Jack Owlesby, and the two Frobishers. It seems innocent enough when they start out, but it quickly becomes much more adventurous and dangerous and wild than they anticipated. The plot of that book (The Pagan Goddess, currently in the process of being published by Subterranean Press), has a plot so… unthinkably… unthinkable that I can’t reveal anything about it without spoiling it, or, more worrisomely, being locked away in an asylum. I’ve started to write a sequel to my novel Zeuglodon (tentatively titled King Solomon’s Ring) and I’m plotting another St. Ives adventure – another novel about the size of The Aylesford Skull. I’m having too much fun with both of these tenuously connected worlds to stop now. Steampunk is such a vibrant, rich fiction genre now, where would you recommend people start? 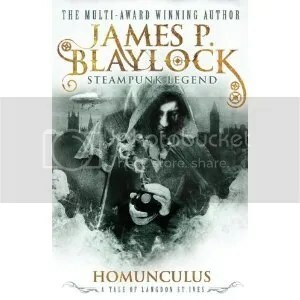 I recommend that people read four seminal Steampunk novels, including K.W.’s Morlock Night and Infernal Devices, Tim Powers’s The Anubis Gates, and my own Homunculus (which is due out from Titan Books in February.) I’ll also recommend an exceptional Steampunk novel written by William Gibson and Bruce Sterling, titled The Difference Engine, published in 1990. More recently, there was a cool anthology of Steampunk and Gaslight fiction (Steampunk fantasy) published in 2011 titled Ghosts by Gaslight, edited by Jack Dann and Nick Gevers, that’s loaded with good stories. I’m also a fan of The Bookman, a wild Steampunk novel by Lavie Thidar, and also any of the Steampunk productions of Jeff and Ann Vandermeer, particularly Steampunk (any of the volumes) and also The Steampunk Bible, by Jeff Vandermeer and S.J. Chambers, which contains articles on Steampunk writers and their books, as well as all sorts of other fascinating stuff. That’s a start. Thanks to James for the interview, and check back at noon today for my review of the book. 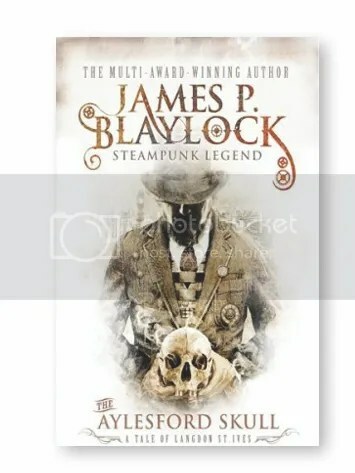 This article was posted as part of the Aylesford Skull Swashbuckling Blog Tour celebrating the release of James P. Blaylock’s first full-length steampunk novel in twenty years [The Aylesford Skull, Titan Books, £7.99]. 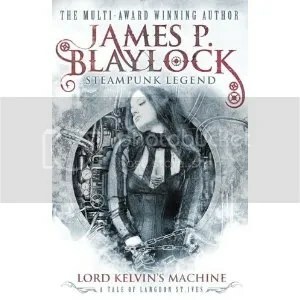 For the opportunity to win a limited edition of The Aylesford Skull in a jacketed, signed hardcover with a unique jacket design, just tweet “I would like a limited edition of the Aylesford Skull @TitanBooks #Blaylock”.